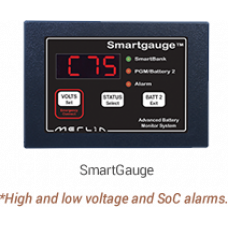 SmartGauge is the most accurate battery monitor currently available today. Model-based battery monitor for 12 and 24V systems. Always tracks battery SoC and never needs synchronization, unlike amp-hour counting monitors. 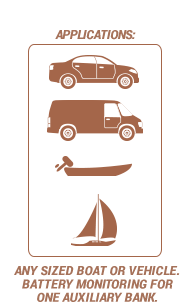 Provides voltage and SoC percentage readings for the auxiliary battery and voltage for the engine-start battery. Unmatched battery monitoring accuracy allows for auto-start/stop of generators, load shedding or trigger of external alarms when necessary. While there are many battery monitors available that count ampere hours to display state of charge (by using a current measuring shunt), one drawback can be their accuracy over extended time periods. If you are prepared to periodically re-synchronise your monitor, then the BEP 600-DCM is a good example. If however, you don't want to worry about whether your monitor is telling the truth or not and don't want to have to regularly remind it of your batteries state of charge, then the SmartGauge is the ideal solution. Designed by Merlin's own R&D team, the unit uses an advanced computer algorithm to display voltage (2 battery banks) and state of charge (1 battery bank), using just two or three wires. There is no need to cut into heavy negative cables to install a shunt, as the unit doesn't require one. In addition to being very easy to install, SmartGauge is also very easy to operate â€“ perfect if you're not familiar with battery technology. The algorithm within the unit self compensates for changes in a batteries health and charge efficiency factor over time, ensuring that the unit remains accurate throughout the life of the installation. 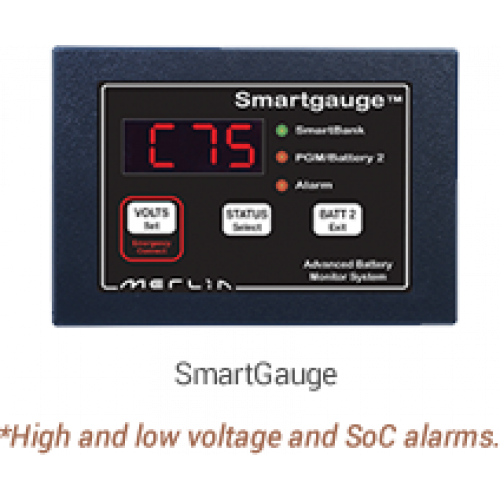 SmartGauge is suitable for both 12 and 24V systems and provides user settable alarms. The most advanced, yet simplest to use battery state of charge monitor currently available. Unlike ampere hour counting battery monitors, Smart Gauge cannot run out of synchronization with your batteries. Displays voltage and charge status as a percentage on an easy to read, LED screen. User programmable alarm functions. Can be used to control a battery combining split charging system (Smart Bank Advanced). Supply Voltage Range: 8-40V DC. Supply Current (Sleep Mode): 5mA. Supply Current (Display On): <15mA. Operating Temperature Range: -25 To +85C. Accuracy For State Of Charge (Charge): +/- 10%. Accuracy For State Of Charge (Discharge): +/- 5%. Accuracy Voltage: +/- 0.5V DC. Dimensions (Front Panel): 110 x 76mm. Dimensions (Body): 95 x 64mm. Protection Rating: IP20 (Front Panel IP65).